Brahmi is scientifically proven as a brain tonic. Brahmi milk is not only good for growing children to increase memory but also good for old age human to keep memory stable. This product comes with pack of 12 bottols with special offer price. Brahmi is scientifically proven as a brain tonic. It is antioxidant, improve memory is widely available in India. Grows very fast within (30 days) a cash crop for farmer. 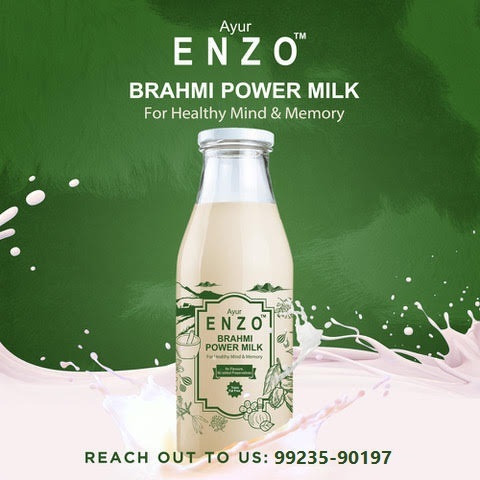 Brahmi milk is not only good for growing children to increase memory but also good for old age human to keep memory stable. Latin Name : Convolvulus pluricaulis Chois. Part Used : The whole plant is used in Ayurvedic system of medicine. Effect on Dosha : Pacifies Tridoshas especially In Vata and Pitta dominating disorders. A perennial herb with prostrate branches and small elliptic to oblong, lanceolate, obtuse, mucronate leaves, Flowers mostly solitary in upper axils. Corolla blue rotate and broad funnel shaped, capsule globose. Brahmi is a popular brain tonic. It is used to promote overall mental health while rejuvenating the optimal function of the brain. Brahmi is believed to provide the following health benefits. Brahmi is used to treat pain due to nerve problems. A paste made from Brahmi leaves and carrier oil are applied to the the affected area to improve the symptoms. It is used to treat neuralgia and sciatica. Brahmi in Ayurvedic Medicine. Brahmi has long history in Indian Ayurvedic medicine. It is widely used for its effect in blood circulation that promotes efficient function of the liver, lungs and the kidneys. Brahmi is traditionally used to treat skin problems including psoriasis, eczema, abscess and ulceration. Brahmi is used to stimulate skin cell regeneration and growth. Brahmi stimulates kidney function. It promotes the efficient functioning by the kidneys. 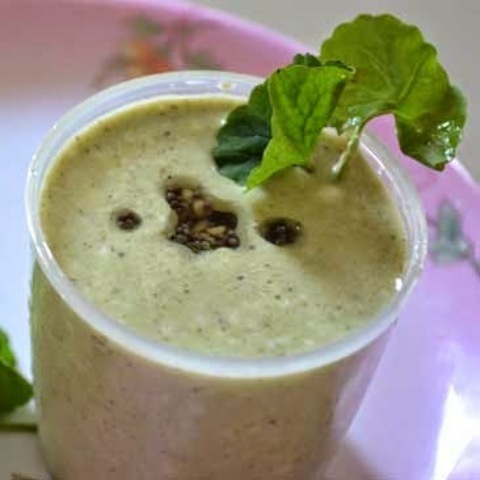 Brahmi improves the body metabolism. It is believed to increase the triiodothyronine (T3) and thyroxine (T4) in blood.T3 and T4 help control your body metabolism. Brahmi has anti-inflammatory activity. Brahmi leaves are mixed with other oils and massaged directly to the affected area to alleviate pain and swelling. Brahmi is used for the treatment of rheumatism, arthritis, gout, and other body and muscle pains. Brahmi is used to promote overall health. Brahmi leaves made into a decoction such as tea can rejuvenate not only the mind but the entire body. It combates stress and fatigue. Brahmi has respiratory health benefits. Brahmi leaves decoction is also used to improve the symptoms associated to respiratory problems that may include cough, colds, bronchitis and asthma. Is is also used as a poultice and applied over the chest to improve breathing. Fever. The juice from the Brahmi plant is used to treat the symptoms of fever. Brahmi is used for stomach problems. Brahmi tea is taken to treat constipation and flatulence. 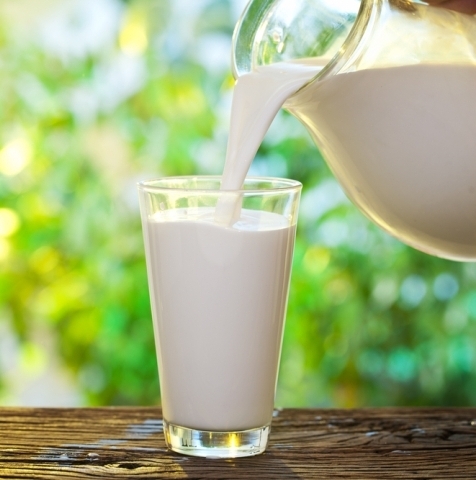 For younger children, the warm juice are applied over the stomach to relieve stomach pain. Brahmi is used for hair and scalp care. Brahmi is applied to the scalp to promote hair growth and prevent hair fall land greying hair. It is used to treat baldness. 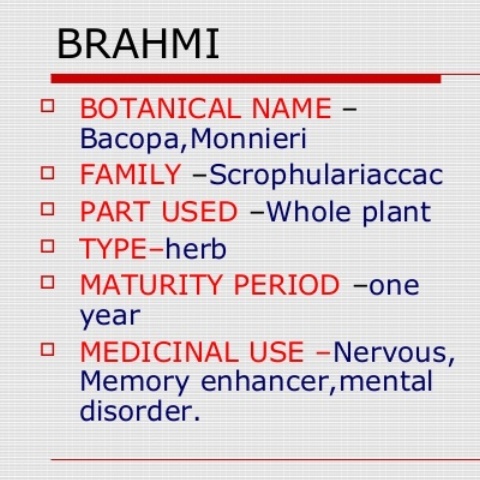 Brahmi as an asthma treatment. A study conducted to determine the broncho-vasodilatory effect of Brahmi extract suggests that constituents found in Brahmi inhibits the formation of calcium ions thereby affecting a broncho-vasodilatory activity.